Claude Monet was one of the key figures in the Impressionist movement. He is known especially for his loose brushwork and his treatment of light. Odd advice from Monet? "When you go out to paint, try to forget what objects you have before you." In the suburbs, Parisians escaped the pressures of modern life. Monet painted their sun-drenched pleasures. 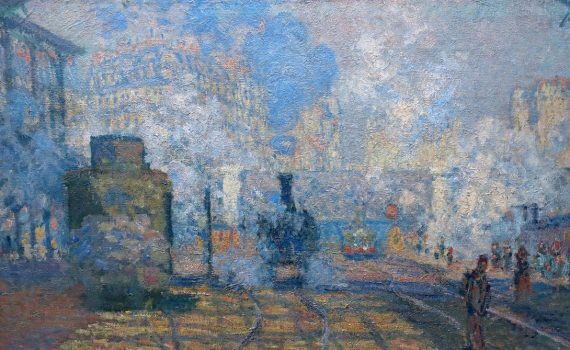 Hazy with smoke, the architecture of the train station and technology of the iron engine dissolve before our eyes. Which of these paintings do you like better? Watch this video before you decide. Monet’s painting technique is perfectly suited for depicting this windy seaside day on the English Channel. Obsessed with this view, Monet paid the owner of the trees not to cut them down until he finished his paintings. Monet had an apartment near the cathedral and worked on several canvases at once to capture the changing light.